Raj is my young blogger friend whose insights into things both ordinary and extraordinary are fascinating. 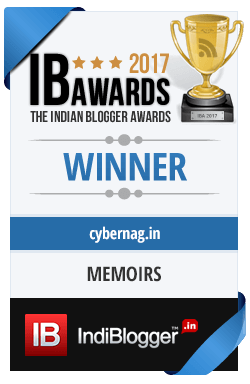 He is one versatile blogger who has something for everyone on his blog Beautiful Mind – features, stories, cartoons, humour and even recipes! I like his nostalgia pieces the best, though. In this guest post, Raj talks about the two most important people in a child’s life with a mix of nostalgia and a fascinating glimpse into our very psyches and how we each come a full circle in our lifetime. Read on…. When I was young, I used to hear my mom tell stories about her mom, her dad, sisters, brothers, the house, the village, the pond, and everything else under the sun that she had seen. She was the third among nine (naughty) children. She used to tell lovingly of all the gifts she got for each and everyone of them when she went home on Diwali and Pongal holidays. I have heard every detail, every mischief, every joy and every sorrow she has relished, endured and inhaled. I know by memory, by year, by occasion, by person — every gift my mom has got and I have seen her eyes light up as she read me loving letters from her family. I have never ever needed a second lesson on compassion or a better glimpse of happiness after that sharing. I have asked my mom at least a 1000 times and my dad, well let us say, 50 times about their love story. How did it all begin? Who said what? I haven’t gotten more than a few residual facts and superficial details about where they met and their common friends and activities. No drama, no suspense, no romance, nothing! I have often wondered how on earth such shy people ended up loving each other and indeed what love had meant to them. They are from different castes and naturally — I am talking about the 1950s here — there was opposition from both sides. But the one thing that I know about their love is that they waited 12 years for all of my mom’s sisters and my dad’s siblings to get married so that their parents would approve of their marriage. They married when my dad was around 40 and my mom was around 34. I understood all about “real love”! My mom and dad came to a new city that was unfamiliar to them at a young age and built their lives, first individually and then together, against all odds. That was how I first learnt to face adversity. They started out as stenographers in the Government of Pondicherry and when she retired from service, my mom was a Deputy Secretary while my dad finished as an Under Secretary. They were hailed as two of the most dedicated and sincere workers of their time. Every time I heard my mom recount the incidents when my dad had stood up to his seniors, corrected them and refused to budge from his righteous position, a heady pulse of pride ran through my veins, tickled my brain and strengthened my heart. Every time she said my dad could have easily been a Secretary if only he had been a little more flexible when it came to principles, I felt so happy that he wasn’t one because it meant he hadn’t compromised. Now I know that even without those lessons in integrity in my moral science classes, I would have done just fine. My mom delivered me at the age of 45 and my dad won his last tennis tournament at 70. It is not difficult to understand where I get my strength and endurance from. Life may have been created by God or Science and evolved by chance or by design. But our life and the world as we know it, is designed by two individuals who meet by chance. They introduce us to the world and they are our world until we develop wings and set out to shape our destinies. We do not see them become the man and woman they are, firsthand, but somewhere between our heart and brain we know it all. There is an invisible life thread inside us that is interwoven with their fabric that helps us document their lives into us and establishes a psychedelic connect beyond cognition. Their lives are biographies that portray how our lives would have been in a different era. We come to know us as them. The revelations will keep coming. And the biggest, yet most elementary revelation is that we all end up where we started, as we started. In essence, we live three lives. When we are children, we see lives through the eyes of our parents. We look up to them. We want to be them. But soon we metamorphose into a second life where we see no one. We are encapsulated in a glass box with mirrors of all sizes that feed our egos with larger than life illusory images of ourselves. We think we are unique and superior and by comparison, our parents’ lives suddenly appear shallow. We soar so high and so fast that we fail to see the hand that is holding us from falling and the other one that puts us into orbit. We shine up there….for a while. However, all stars become dust someday and life pegs us back to our final chapter: as the parent. Now again we see life through our children’s eyes and act as their beacon, shining and filling their lives with happiness and marvel. We die as the child who lived and loved a child beyond fathom. We are our parents and our children are us more than what the genetic code has written or God’s magic wand has created. We are what we are and we know what we are the moment we look into their eyes. Excellently written, especially the one reg the three lives, we live. I am now 77 and I got married in my 31st year in May, 1966. It was an arranged marriage. As narrated by you, I was very shy by nature and I will not talk to girls and ladies, even my sisters or my brother’s daughters, if I see them on the road.. Actually, after my Nichiathartham was fixed, I was returning home one day from office thru Kutchery Road in Mylapore. I spotted my would-be along with her sisters selecting bangles for her (my wife was the youngest) and the moment, I saw her in the bangle store , I quickened my pace lest they spot me and accost me. . Even to-day, my in-laws used to make fun of that incident. I lost my wife lost year, unexpectedly and she also used to refer to this characterestic shyness. The youth of yester -years, were mostly shy by nature and will not mingle with girls of their age. We of the older generations, believed more in anticipation and vicarious pleasures, than immediate gratification of one’s desires, however legitimate it may be. For heavens sake, pl do not mistake, I am against the modern trend. Immediate achievement denies one the sense of anticipation, which is more pleasureable and applicable to love than any thing else. Correct me if I am wrong. The child crying for the candy, if pampered immediately, reaches the point of satiety once it gets what it wants.. Perhaps, Gen Y and Z believe that , only the crying baby gets the milk. Perhaps, they me be right. OMG!!! I am so sorry that I kept this post for later reading and delayed reading it until now!! I love this post so much that I want to hug it and never let it go !!! Thank you so much for the wonderful words Ashwathy. 🙂 I am really humbled and your compliments made my day. Am so glad you love the post so much. i just was dumbstruck that your parents waited for all their siblings to get married and they themselves got married at that age. truly, love has no age. god bless them! do you have siblings? I would also like to add that we are the manifestations of the unfinished agenda of our parents and should attempt to at least emulate what they expect us to do and carry forward their vision forward. Most certainly. That is a wonderful thought. It would indeed be very satisfying and fulfilling if we carry forward the dreams and vision of our parents. Thank you so much A-kay for the nice words and I am so glad you were able to relate to this. You are absolutely right. I have felt that so many times. Whenever I sit back and think about something I have done and the way I do it, more often than not there would be some resemblance and I would trace it back to my parents. And that process happens unconsciously too. A very very poignant post, sensitive piece of writing, Raj. And all the more as you so beautifully illustrate the proverb “Child is the father of man”. Thank you so much Sudhagee for the lovely words. 🙂 I am so glad you liked it. “Child is the father of man” – that is such a profound proverb which is true at several levels. I followed a link here from Bikram’s blog, and I’m so glad I did. I find that what you have wrote here is so accurate and true that it’s brings back memories when I was growing up and how I connected with my parents. I look forward in reading more. “We are our parents and our children are us”–profound on many levels. Not merely psychologically but at some strange level when I watch friends and relatives complete go through their journey, it often seems they are walking through their parents’ journeys–albeit with some modifications. Loved your post! Thank you! Thank you soo much Bhavana. Am so glad you liked the article. 🙂 Very well said. There is a connect and similarity between parents and children and we get to see that among friends, relatives and people around us. Very true. We are what we are, because of the love and care showered on us while we were young. We are grateful to them for giving us an identity . A very thoughtful post,i am glad i chanced upon it…..what a perceptive thought-that we are linked to our parents through an inner thread as it were….this enables us to envision even what happened before we were born. Raj, to you and to your parents, my heartfelt admiration. The above referred Kural came to my mind, immediately when I read your post. To ack. one’s parents, in a beautiful post , is a great tribute to them . Nice to know you and your parents through your writing. Zephyr, thanks for giving a chance to Raj. Thank you soo much Pattu for that wonderful kural. 🙂 Lovely words with a profound meaning. I remember reading this long back when I was a child. Inspiring story of your parents. And I now I know why you are such a gem of a person and a writer…. Such a warm and wise post. Almost like soft cushy bed brimming with security. I am not the religious sort but somebody someday had said that EGO stands for “easing God out”… and even though it might sound silly to our rather egotistically acclaimed logical minds, somewhere down the line, it is the truest thing ever. The three lives are very rightly depicted. It is only when we burn to ashes that we realize that we are made of mud and consequently, we learn to adore the fact. Experiences always help of course, but nevertheless it is our roots that make us who we are. Thank you so much Enchanta. That was a lovely comment. Very thoughtful and deep. “Only when we burn to ashes that we realize we are made of mud” – Beautiful and very true. Emotionally charged, profound lines woven so delicately to create an outstanding homage to the ones-who-created-us, held our hands and gave us the courage to dream. A standing ovation for this post! That was simply a poetically beautiful line. Really touched my heart. I agree with you, Raj. We think the world of our parents as kids. Then we are full of ourselves and cannot imagine we are anything like them. There are occassions even in this phase when we sometimes can’t help but appreciate the many things they do for us. The third phase is the really rewarding one when we begin to feel comfortable in our own skin and see others around us more clearly. That’s when we realise how wonderful our parents really are after all. You said it all beautifully. In the second phase we feel and appreciate what our parents to do but sometimes fail to admit it openly. But then in the third phase the realization sets in and we start seeing things clearly. Thank you very much Arti for the lovely words. 🙂 Am glad you liked it. And you said it beautifully. It is their selfless love that truly defines us and shapes our lives. Very interesting read, Raj. I am fascinated by the story of your parents, them marrying so late; your mother having you at 45. It is indeed a great tale. You have had a great upbringing; it is pretty apparent in the way you write and the depth of understanding that you display. I will be sure to rush to your blog now :). I hope you continue to keep your feet planted on the ground. Indeed, we are blessed to have the parents we have. I feel similarly too. Thank you so much Rachna. I truly have been blessed with wonderful parents and a very happy and memorable childhood. 🙂 And yeah.. we all are truly blessed by God’s greatest gift: our parents. Life comes full circle…..so very well written. All parents can identify with the thoughts. Thank you so much Alka. 🙂 Very true. Life does come a full circle and only when a child becomes a parent, he/she realizes the innumerable sacrifices that make up the life of a parent. Wow! what a poignant post..your mom and dad are truly awesome..:)..I love the way you write Raj..
🙂 What a warm and wonderfully written post, Raj. I am looking forward to visiting your blog, just as soon as I comment here. It was a joy to read about your parents – it is true we are our parents. 🙂 And why not, when they are fantastic people! I do not know my father – but my Mother was an entire family to me. I had the privilege of growing up with my grandmother – and consider myself totally blessed for the experience. There’s nothing like the south Indian matriarchal joint family to teach us valuable life-lessons. Zephyr – loved the post – you are a connoisseur! By far one of the most beautiful posts I have ever read, Raj. Probably whatever I comment on this post would seem very less. 🙂 Made my day! Akshay.. I am totally humbled by your words. 🙂 Thank you so much. It means a lot. I usually post the first comment on any guest post, but this time I was beaten to it by so many! That shows what a great post this is. 🙂 I love the way you link the real to the ethereal, the fact to the abstract. This one is no exception. The concept of the circle of life is so well brought out. But I agree with SRA about the repentance part in the last stage. Thank you so much Zephyr for the wonderful words. It really means a lot coming from you and I was really very happy while I was writing this post. It felt good and a satisfaction beyond words. In the end you have summed it well but I would like to supplement that in the third life, some times , people forget to regret for their act of omissions in the second life! Thank you so much Sir. 🙂 And very well said. People do forget to regret for some of their acts in second life and sadly sometimes they suffer for that due to the second life of their children. This was a wonderful read. Your interpretation of life and the various stages of our life time are indeed grand. So beautiful..I loved this one! Yeah.. come to think of it, those 3 phases are our life, though contradictory at times, are inevitable. Raj, this is a heartfelt and very very insightful post ! We learn more by example than by anything else. And the best examples life can give us are our parents! Thank you so much Ruchira. I am so glad you liked the post. The life our parents lead is the book that opens our eyes to the world and prepares us to face it. Without doubt, it has got to be one of the best posts I have ever read in the blogsphere. I felt humbled by the insight into the bond of love, devotion and character that runs through generations and how, at times, we are blinded by vainglory, only to return to the dust of reality. Zephyr has surprised me with this guest post and I leave her website today with reinforced respect for her for beig a gem herself and above all, her ability of discovering flowers like you in the jungle of gorse and weed. Thank you so much Umashankar for the wonderful wonderful compliment. 🙂 Really made my day. And you said it perfectly. The bonds that we share are much more deeper and intense than we think they are. And we realize it albeit a little late. And I totally second your statement about Zephyr: she is indeed such a gem! ← Whose Right is it anyway? The Cyber Nag by Zephyr is licensed under a Creative Commons Attribution-NonCommercial-ShareAlike 4.0 International License. Ashwathy on Idli-dosas and Me! Zephyr on Idli-dosas and Me!